I understand none of this but I appreciate its remarkable prominent swearing. Oh wait, YouTube does auto-translate subtitles now. OK, I got this. 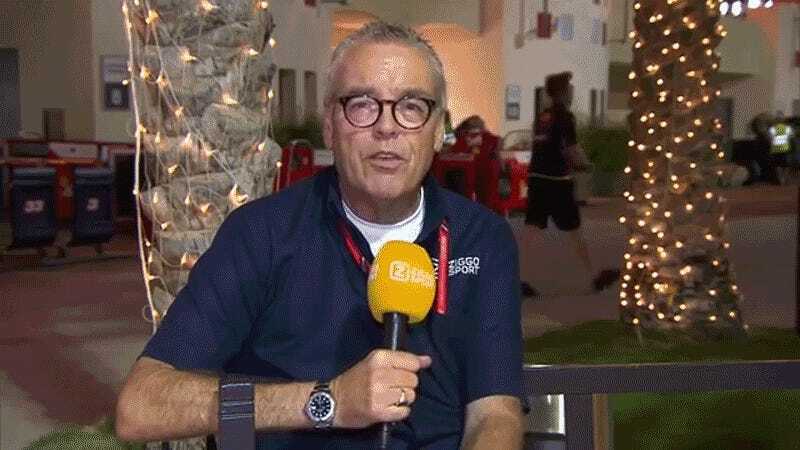 Formula One boy Max Verstappen (he’s 19) is a bit of a prankster, and the young Dutchman decided to playfully interrupt Dutch TV commentator Olav Molfor while he was in the middle of recording a report on rumors of McLaren approaching Mercedes to quietly dump their boat anchor Honda motor. Max gives Olav a pat on the back, they shake hands and Max leaves. End scene.